Budgies -- Melopsittacus undulatus -- also are known as parakeets. They are a smaller bird, averaging about 6 inches. Because of their high energy level, you want to house budgies in as big of a cage as you can. One adult budgie can be housed in a cage no smaller than 18-by-18-by-24 inches tall. 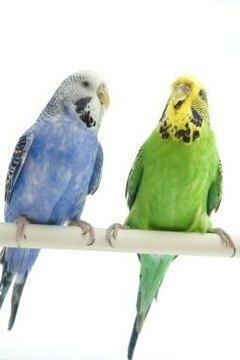 Budgies are flock birds and do best when given plenty of attention, by you and/or a cage mate. If you decide to house two budgies together, you want the cage to be as big as you can afford for the space you have available. The cage likely will be where your budgies will spend most of their time, so you want the cage for two birds to be double the size as a cage for one. The budgies will jump around from perch to perch and fly from side to side, so you want plenty of room for playing, as well as space for toys, ledges, multiple food bowls and other accessories, without the cage feeling cluttered.